TORONTO, Nov. 5, 2015 /CNW/ - In time for Financial Literacy Month, Canadian entrepreneur Teresa Cascioli has launched the next installment of the first all-Canadian children's book series on the topic of financial literacy called M is for Money™. 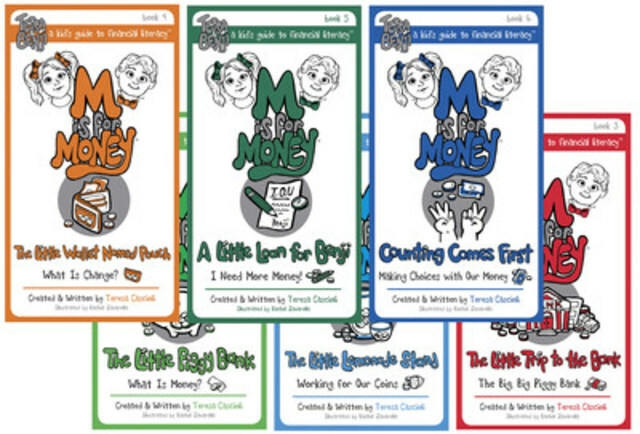 Following on the successful launch of the first three books in September, books 4, 5 and 6 continue to teach important money lessons to children aged 5 through 9. In The Little Wallet Named Pouch, A Little Loan for Benji and Counting Comes First, the main characters, Tessa and Benji, deal with Canadian currency as they learn about a wallet, change, a loan and budgeting. "The first three books, The Little Piggybank, The Little Lemonade Stand and The Little Trip to the Bank have been extremely well received," said Cascioli. 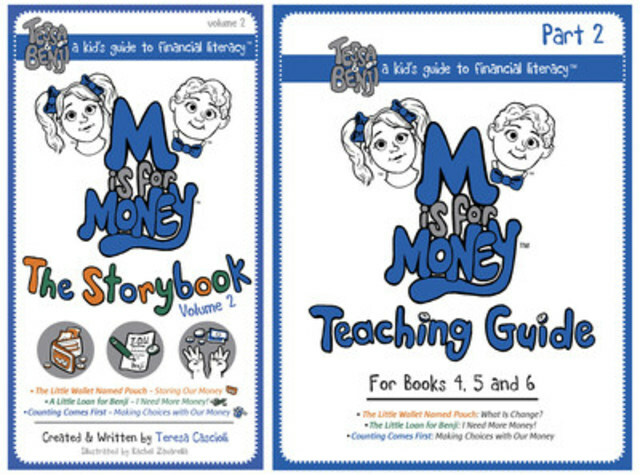 "Many parents, grandparents, teachers and librarians have told me how thrilled they are that the M is for Money books are available to start those important conversations about money." Long before she took bankrupt Lakeport Brewing and turned it into a $201 million business, Cascioli was taught the value of dollars and cents and the importance of making smart spending choices by her parents. Now, as one of Canada's top business minds, she is hoping to spark similar conversations among the next generation of parents and teachers by continuing with the M is for Money series. According to the Financial Consumer Agency of Canada learning financial skills early in life is key to developing financially sound adults. "There is no better time to launch the next three books in the series. Financial literacy is just as important as reading and writing," explains Cascioli. "With so many competing priorities and time constraints, M is for Money gives parents and teachers the tools to talk about money in a fun and creative way," says Cascioli. "Those early conversations helped me have an appreciation for money – how to earn it and spend it wisely." In an era where kids are growing up with mobile pay apps and online shopping, M is for Money sets kids up on the right path to financial literacy and provides them with an early understanding about money to help them cope and succeed in the future. Book 4: M is for Money – The Little Wallet Named Pouch – What is Change? Book 5: M is for Money – A Little Loan for Benji – I Need More Money! Everything about the books from the writing, illustrating, editing, website and printing is 100 per cent Canadian. Fun play merchandise, teaching guides, activities can be downloaded online at www.MisforMoney.ca. A catchy Nickels & Dimes M is for Money™ song is also available for purchase on www.MisforMoney.ca, with all proceeds going toward children's charities across Canada. The final three books in the series will follow in February 2016. Teresa Cascioli is one of Canada's top business minds. She is a commerce graduate from McMaster University in Ontario. As the former CEO of Lakeport she took the company from bankruptcy to a $201 million sale to Labatt in just 8 years. She led one of Canada's most successful income trust public offerings. This award winning entrepreneur has been featured on Profit and Chatelaine magazine's lists of Canada's most successful women and has been named one of the Women's Executive Network Top 100 Canada's Most Powerful Women. She was awarded Entrepreneur of the Year by Canada's Venture Capital & Private Equity Association as well as by Ernst & Young in their Turnaround Category. She was inducted in the Sales Hall of Fame by the Canadian Professional Sales Association. In 2012, Cascioli was awarded the Queen's Diamond Jubilee Medal.